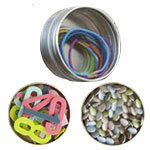 Clear top magnetic storage tins are the perfect containers for scrapbooking, crafts, or home and office organization. 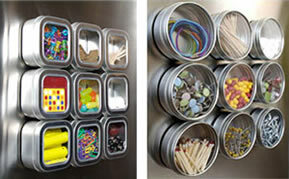 They are food safe so they are also perfect in the kitchen for storing spices, candies and other dry foods. 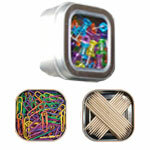 They attach to nearly any metal surface*, including refrigerators, file cabinets, message boards, and more! All products are made in the US from high quality materials. Molded from a single sheet of metal, which makes them durable, seamless and virtually airtight with smooth rolled edges. They are epoxy coated so they are dry food safe, and corrosion resistant.